How much does college cost, and why? The following article appeared in Left Business Observer #125, February 2010. Copyright 2010, Left Business Observer. Like this? Subscribe today! There’s a lot more where this comes fromand only some of it makes it to the web for free consumption. As everyone knows, the way to get ahead these days is by accumulating degrees. A rising education premium, as they say in economics, is the favorite official explanation for the increase in inequality over the last three decades. That’s far from a complete explanation, of courseit overlooks the decline of unions, for examplebut there’s no doubt that the further you get in school, the more money you make. The problem is that it’s getting harder to pay the freight. Graphed nearby is that legendary education premium. Note first how badly high-school dropouts have done. 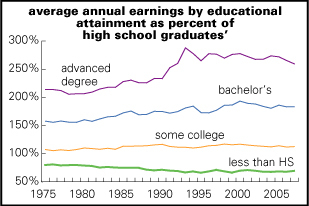 Back in the mid-1970s, they earned about 20% less than those who got a diploma; that deficiency has expanded to over 30%. [Since these are all expressed relative to high school grads, there is no line for themit would be flat at 100%.] The advantage for those with more than high school has grown substantiallythough that trend mostly topped out by the late 1990s. As of 2007, the average college graduate earned 83% more than a high school grad; those with advanced degrees, 159% more. By the way, the increase in the education premium has been particularly strong for women; although the male bachelor’s premium is larger than the female, the patriarch’s advantage has narrowed considerably over the last three decades. But how the price of grabbing the credential has risen! 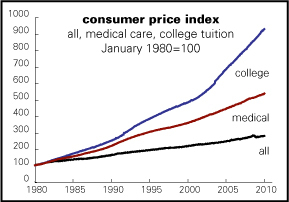 Inflation in college tuition almost makes the medical kind look reasonable. Since 1980, the overall consumer price index is up 179%; that for medical care, 436%; and that for college tuition and fees, 827%. And while medical inflation actually slowed a bit between the 1990s and 2000s, college inflation actually accelerated. Such rates of inflation leave family incomes in the dust. According to the College Board, posted annual costsand in this and all subsequent cases that means tuition, fees, room, and boardfor attending the typical private four-year institution were 26% of average (median) family incomes in 1979; they’re now 58%. For public four-year institutions, the bite went from 12% to 25% of average incomes over the same period. In other words, the burden relative to incomes roughly doubled for both, and the cost of attending a public university now is almost as heavy as the cost of attending a private one three decades ago. Of course, as the old saying goes, only suckers pay retail. There is aid available, especially for poorer families, and not all of it loans, which greatly reduces the costs of attending college. The College Board makes a big deal out of this in its annual reports on the costs of higher education. But many barriers remain. Take, for example, the Board’s estimates of net costs of attendancetuition, room, board, and fees less grantsrelative to incomes. (See nearby graph.) In 199192 school year, the net cost of attending a four-year public institution for a student from the poorest quarter of the income distribution was around 48% of that group’s average income; by 20072008 that had fallen to 44%. At least it hasn’t risenbut 44% is still an impossible number, especially a family with an income of $20,000, the quartile’s recent average. For the richest 25%, the burden was steady, at around 10% of family income. For private universities, the net cost for the poorest quartile went from 63% to 80% over the same period; for the richest, it fell from 19% to 17%. For those in the middle two quartiles, the burdens stayed fairly steady, falling between these extremes. But even for a family in the second-richest quartile, average income around $80,000, a year at a public college still cost about 19% of income after grant aid. Of course, better-off parents have savings to dip into, or grandparents to put the touch on. Still, students from all but the richest families have to borrow to a public university. No wonder two-thirds of college graduates now emerge with massive debtsan average of $23,200 in 2008, up 24% from 2004. These costs are keeping students from poorer families out of college. Thanks to the invaluable work of Tom Mortenson, publisher of Postsecondary Education Opportunity, we’ve got an excellent handle on how this has played out over time. Overall, 17% of Americans had a bachelor’s degree by age 24 in 1970. By 2008, that had risen strongly, to 29%. But, as the graphs on the top of p. 5 show, this increase has been driven mainly by the children of the well-off. The share of kids from the bottom 25% of the income distribution getting a degree by 24 rose from 6% to 9%; for the top 25%, it rose from 55% to 95%. Looked at another way (as the graph on the right does), the offspring of the bottom quarter accounted for 12% of bachelor’s achieved by age 24 in 1970; that fell to 9% of the total in 2008. The share accounted for by the top quarter rose from 52% to 54% over the same period. Clearly there are a lot of cultural barriers for poorer people getting to collegeand maybe some have no desire even to try. But there’s no doubt that money is also a major factor. Why has the cost of college risen so sharply? To the right, the answer is simple. A 2005 paper by the Cato Institute puts almost the entire blame on Washington: overly generous federal subsidies have made it easy for universities to raise prices. Get Washington out of the college business, and the market will take care of the rest. It makes this preposterous argument with more quotes from Hayek than citation of actual data. Another popular explanation, faculty salaries, doesn’t really hold water. Average pay for full-time instructors since the early 1990s is running only slightly ahead of inflationand the use of part-timers has proliferated. Universities have added some layers of management, but that can’t explain a sustained inflation rate more than four times the overall average. The real answers are slightly more complicated, though actually not all that terribly so. At the very high end, elite universities are in something of an “arms race” to get the most desirable students. They want to pamper and seduce, with everything from food courts to saunas to supercolliders. And since they typically offer poor students full scholarships, they can assuage any class guilt they suffer by presenting themselves as selection agents for the meritocracywhich they are to some degree, if not the degree they’d like to imagine. And given the swelling in the college premium, parents with the means to pay the bills demanded by Harvard and Yale are happy to write the checks, since the eventual degree will grease their kids’ way to the hedge fund trading desk. But the real crisis of college affordability is among the public institutions. And the reason for that is pretty straightforward: sharp declines in public support. For example, the University of Virginia, one of the so-called “Public Ivies,” got 33% of its budget from the state in 1989; that was down to 12% in 2009. Tuition accounted for 19% of revenue in 1989and 31% in 2009. Overall, as the nearby graph shows, state and local funding has fallen hard since 1980, and students and their parents have taken its place. That reversed the trend of the previous twenty years. 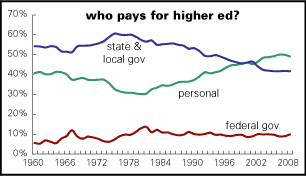 Between 1980 and 2008, the share of higher ed expenditures coming from government fell by almost 19 percentage pointsthe amount by which personal expenditures had to increase. It would not be hard at all to make higher education completely free in the USA. It accounts for not quite 2% of GDP. The personal share, about 1% of GDP, is a third of the income of the richest 10,000 households in the U.S., or three months of Pentagon spending. It’s less than four months of what we waste on administrative costs by not having a single-payer health care finance system. But introduce such a proposal into an election campaign and you would be regarded as suicidally insane.